— well, not quite, I was thinking of her as I walked along the river. 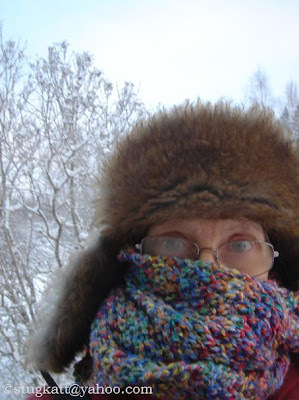 And I was very, very happy that I had the muffler she made for me, as it was -28,2°C ( -18,9°F). Wishing you all the kind of new year you want! Heisan Margaretha...kan nastan inte se dej for den stora scarfen...-28...det ar kallt. Vi har haft nagra av dom kalda dagarna har ochsa, men idag var det-3 och vi akte skidor...sa jatte kul var det...antligen har vinter kommit till Montana. Beautiful scarf. I have a friend in Moscow who told me it's -5 there. I think you are both brave. When it comes to cold weather, I'm a whimp. By the way--did your book arrive? Happy New Year to you, Margaretha. I enjoyed the blog walk but I think I am pleased that we never get those low temperatures here. Even a muffler and furry hat would not tempt me to go outside! Too cold, if you ask me! Nej, och jag kunde nästan inte se ut heller, eftersom glasögonen immade igen. Hoppas ni får en perfekt vinter för uteliv! Unfortunately, we have no choice when it comes to the weather. I don't like hot weather, but this is not to my liking either. Yes, the book arrived and we love it! No, this is not pleasant - not even with your lovely muffler. This is not the time to visist me - you should come in the summer when it hopefully is pleasant to be outside - but I can't promise anything, last summer was rather cold and wet.